I've got to be on my best behaviour tonight. Officer Davis Quinton of the RCMP detachment in Dog River is dropping by the studio. Yes, that's right, Lorne Cardinal, who played the beloved goofball cop on the hit Corner Gas, is one of our guests tonight. The other is his right-hand woman/gal pal Monique Hurteau, who also happens to be a stand-up comic/motivational speaker/personal trainer. We'll concentrate on the comedy portion of those forward slashes and find out what these two fine entertainers are up to these days. 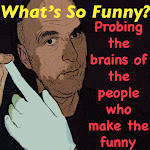 So set your PAR (personal audio recorders) for 11 pm tonight to What's So Funny? on CFRO 102.7 FM.